Stand Up Paddle Surfing: Paddle Surf Baja: It ain't easy. If you want to stand up paddle Baja California, you've got to know a few things. First of all, driving the Baja Highway ain't for the timid. The road is narrower than you are used to, there are no shoulders (the pavement simply drops off at the edge- perfect for rolling a car) and the truck drivers like to play matador games that will get your sphincter clamping like a hydraulic vise. Other than that, it's bitchin- if you know what you're doing. Check the next couple of posts and I'll get you Baja-educated with some pointers. 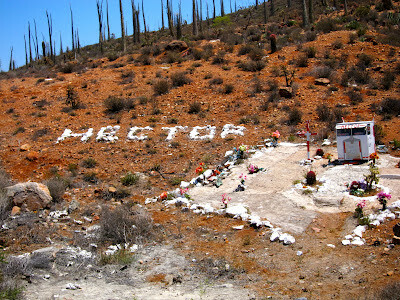 The infamous Hector memorial. 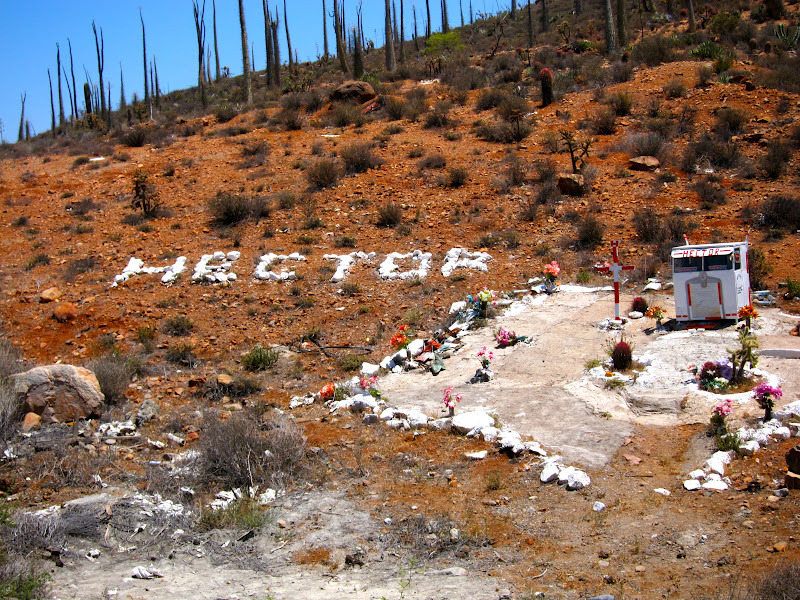 These little markers are set up by the families of those who've died along the road. Hector's used to be just that little model of the truck he presumably used to drive- it's getting bigger every year. Like I said, the highway is a dangerous route, take your time and be alert. Lesson Number 1: Buy car insurance. Yeah, I know, your buddy told you that you don't need it because your credit card's got you covered or the toll road on the cuota pays your insurance while you're on it, or your car insurance actually covers you in Baja- these excuses are just a list of maybe situations. Let me give you a certainty: If you get in an accident in Baja, you have just broken the law. And, if you don't have auto insurance- you just made your life much more uncomfortable, in Baja, in jail. So do it- get yourself covered, it's easy to do. Here's how I do it: Go online and buy it at BajaBound.com. This is a no brainer, select the coverage you want, pay on their secure site and then just download and print the policy. Easy. These guys are known in Baja- if you have a problem and the officials see that you've got a BajaBound sticker everything get's real tranquilo- believe me, I've been there... but that's a story for another post.